Home Blog General What is Dog Spraying? You love your daily walks with your four-legged friend. Not only does it allow you to get outdoors but it’s also a time to bond with your loving companion. Everything is going great until your dog makes you stop on EVERY tree so he can do his business. However, you notice that he is only peeing a small amount and it doesn’t actually seem like he is going to the bathroom at all. So what could this be? Why does your dog spray and how do you get him to stop this behavior? To find the answer to these questions, continue reading below. For those of you who do not know, dog spraying, or urine marking is a common act in both males and females. Urine marking can happen in the park, on the walls of a home, and any other vertical space that your dog deems necessary to mark. In most cases, a dog will find an area, lift one of his legs, and excrete a small amount of urine in that particular space. Although this may seem like a minor issue if it occasionally happens on walks, random urination can also be indicative of a more serious underlying issue. That’s why it is imperative to be able to recognize the difference between urine marking and other canine bladder issues. This article will go over why dogs spray, what other urine problems could be at fault, and what you can do as their owner to fix their behavior. By educating yourself, you will be able to fix the issue and keep your pet happy and healthy. As you could probably assume, much of these issues arise due to the dog feeling threatened about their territory. Whether it’s another pet within the household or even another person in the family, an animal may begin to feel insecure and that their personal space is being threatened. If that is the case, they will begin marking or spraying areas that they deem to be theirs in order to warn or signal to other animals. Although this behavior is completely fine outdoors, the issue can quickly escalate if your dog brings this dirty habit inside the home. Not only will they urinate on any area that they think is there’s, but there is also a high probability that they will revisit these areas if they pick up their previous scent, causing the problem to repeat. Dog’s will continue this behavior for as long as they feel threatened. 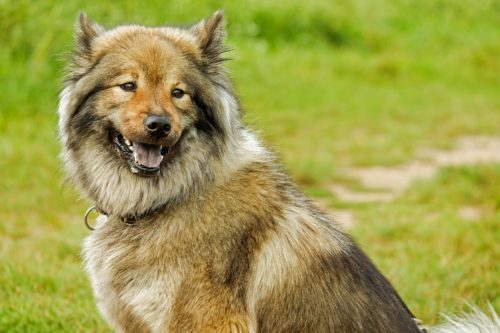 When a dog is deliberately marking his territory, this is not an issue of housebreaking or not, they are purposely trying to tell someone or something not to trespass on their area. That’s why nipping this habit can be difficult in some cases. In order to prevent this behavior from happening, you have to uncover what is triggering your dog to behave like this. It is also a good idea to take them to the veterinarian just to ensure that there is no underlying health issue causing these actions. Although all dogs can spray, most situations where this problem occurs is when a dog has not been spayed or neutered. 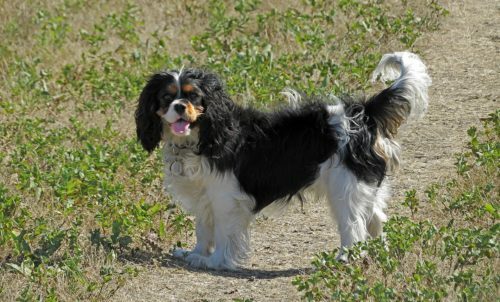 Male dogs who are reproductively intact may spray to ward off other competitors while females will spray before or during the time they are in heat. If your dog has a terrible spraying problem and they have not been fixed, veterinarians highly suggest doing so. Although it may not completely rid your dog of this issue, being spayed or neutered has proven to significantly lessen this behavior. Social triggers can cause your dog to urine mark for a variety of reasons. Whether they become excited after coming into contact with a female dog or even a new person in the household, a dog may begin to spray from just the slightest changes in their environment. If someone new has entered into the home, your dog may feel the need to mark their territory. In order to prevent this from happening, you must give a formal introduction for your dog to the new person or animal who they are feeling threatened by. Do not allow the person or animal to stay in your dog’s space until they have been properly socialized with one another. This will help to reduce any anxiety or fear your dog may be feeling. Unfortunately, sometimes dog spraying can be an indication that your pet is suffering from anxiety. Now anxiety is not uncommon for our furry friends and can be brought on by a number of different reasons. Whether their anxiety stems from being left alone or they are afraid of an actual situation, many dogs will develop unfavorable behaviors, including spraying when they feel anxious. If your dog’s spraying is due to their anxiety, the first step you have to take is to find out what is causing your dogs anxiety in the first place. Pay close attention to when your dog’s behavior begins to change and notice if there are any patterns. Once you are able to identify their underlying source of anxiety, you can then begin behavioral techniques or eliminate their trigger altogether. If you have just brought in a new dog and they begin to pee in your home, this could mean that they have just never had the proper training before. This is especially true if you adopted them from a shelter where you have no clue about their previous history. If this is the case, your dog will be peeing wherever suits them best. Unlike spraying where they only excrete a small amount of urine, your dog will fully go to the bathroom as if they were outside. If you think this is the cause of your dog’s indoor bathroom habits, start house training them as soon as possible. No matter what age they are you can still teach an old dog new tricks. If you are having a difficult time or you are an inexperienced owner, try taking them to a dog training course for professional assistance. Unfortunately, in some cases, your dog’s health condition may be mistaken for their annoying marking habits. 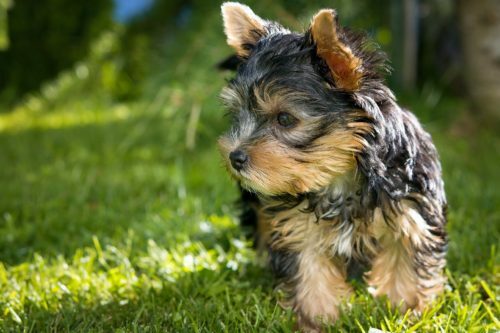 Urinary incontinence in dogs is a condition that causes your dog to leak urine. This medical problem can be caused by bladder stones, spinal cord disease, urinary tract abnormalities, and many other issues. If you think your dog is suffering from urinary incontinence, get them to your vet as soon as possible. Once there, your vet will be able to run a series of tests and then create an effective treatment plan to get your dog back to normal. If your dog’s peeing habits are only occurring when they are being greeted by visitors, when they are being scolded, or after coming into contact with another dog, this could mean their problem is caused by excessive excitement. Most of the time in these situations, your dog will also exhibit several changes in their body language as well. If this is the cause of your dog’s issue, talk to your vet for tips and recommendations on different training techniques to teach your dog to react a different way. Dog’s suffering from a UTI will have the constant urge to pee, and usually will not have enough time to make it to their designated bathroom. Common symptoms of a UTI include straining while urinating, experiencing pain while urinating, blood in the urine, breaking normal household rules, and licking the genital area. If your dog has exhibited one or more of these symptoms, get them to the vet as soon as possible. From there, your vet will then run a urine test to see if an infection is present. Once the vet has come up with a diagnosis, they will be able to prescribe the right antibiotics to help fight off the infection. If bladder stones are present, your vet may recommend surgical removal. If your dog is starting to spray or “mark” his territory, now would be a good time to consider spaying or neutering them. If they have not already, getting them fixed is the easiest solution to helping mitigate their issue. Not only will getting them spayed or neutered lessen their marking habit, but it will also help to prevent certain health issues from occurring later on in life. In female dogs, spaying can help your dog live a healthier and longer life because it prevents breast tumors and uterine infections. For males, getting neutered can prevent prostate cancers and other complications within their reproductive system. If your dog is spraying your home due to excitement or any kind of trigger, try reducing their exposure to the thing that is causing them to react. If they become excited from a guest entering your home, talk to your veterinarian about training recommendations on how you can change this kind of behavior. For instances where your dog is marking specific areas or objects of your home, try to associate those triggers with a more positive experience by placing treats in these spots or playing with them there. Eventually, your dog will no longer associate this area with a place to mark, but as a positive place where they receive love and attention. No matter where your dog chooses to spray in the house, make sure to thoroughly clean the area as soon as possible. If a dog can smell an old scent, they will most likely revisit the area and remark it for good measure. Keep in mind that you will have to find a product that works specifically for cleaning this type of mess. An enzymatic cleaner is highly recommended to remove all scents of your dog’s marking. You can find these cleaners at most pet stores or grocery stores. If the dog’s marking is due to stress, the first order of business is to uncover the source of their problem. If possible, remove the given object that is driving their anxiety. In cases that their anxiety is brought on by another animal, try consulting a professional dog trainer. These training sessions can help immensely if two of your furry companions are feuding. In the case that your animal is reacting to a new person within the household, do whatever you can to create peace between the two. Have the person give your dog treats, take them for walks, and feed them when necessary. These easy adjustments can establish a more welcoming and positive environment within your home. Lastly, If you think that your dog’s urine marking is an underlying health issue, take him to the vet as soon as possible. Your vet will be able to run all the necessary tests to conclude a proper diagnosis. As soon as you take your dog in, make sure to provide your vet with a complete summary of all your pet’s symptoms and a detailed record of their overall health. This information can provide key insight and help significantly when researching your dog’s overall health. At the end of the day, dog spraying usually is a sign that your pet is uncomfortable or wants to tell you something. If this is the case for your pup, pay attention to the common factors that are present during their spraying to discover the source or trigger that is causing it to occur. If you have followed these tips above and your dog is still spraying within the home, consult with a professional for further guidance.